Bread and Butter World - Homebrew - SMS Power! The Game Police are after Bread and Butter! The Game Police are a paramilitary organization that enforce draconian standards on modern games. Their code demands that all modern games released on consoles must have hour long tutorials, 60 hour story modes, lengthy cut-scenes with no player interaction, consist of polygons, and use all 8 buttons on the controller among other things. 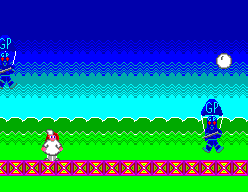 Being in short, easy to pick-up and play games with 2-D graphics puts Bread and Butter in violation of multiple portions of the code. Men dressed in body armor carrying rifles and tazers are now hunting them! Punishment for violating the Game Police code includes imprisoment and "re-education" where the subject is tortured and broken until they give in to the code. Bread has a plan! The highly trained and well equipped officers of the game police are expensive,and they're funded by a private investors. If the private investors were to go broke, they wouldn't be able to pay their officers, and then would not be able to operate. By sneaking into the investors' four offices and destroying their computers and financial records, the Game Police can be bankrupted. Can these two youths sabotage the Game Police before they are captured? Each level is broken into four sub-levels. Sub area 1 - Bread collects eggs. Sub area 2 - Butter collects milk. Sub area 3 - Bread collects flour. The Bread of Legend is baked. Sub area 4 - Butter jumps from platform to platform up a tall building. Then he sneaks into the computer room through a window. The Bread of Legend is released and the computer room is destroyed. Once all four computer rooms are destroyed, Bread and Butter run freely into the sunset. This game is for one player only. "START" - Begin the game at level 1-1. "CONTINUE" - Begin the game at the last stage you died on. "EASY", "HARDER", "BAD IDEA" - Controls the length of each level by 16 screens, 32 screens, or 64 screens. You get three lives. If you run out of lives you may continue from the title screen. You get three more lives, but your score is reduced to zero. Make Bread or Butter move right. Make Bread or Butter move left. Jump. Hold down on the jump button to keep going up, up to the maximum jump height. Release button 1 in mid-jump to stop going up. 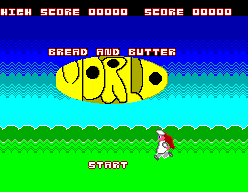 Bread and Butter can disobey the laws of physics and move left or right while in mid-jump. Run. Hold down on button 2. When pressing right or left, Bread or Butter travel twice the distance in the same amount of time. Release button 2 to stop running. Stop the game. Press PAUSE Again to restart the game. Erase the high score and return to the introduction screen. 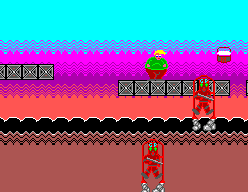 You die and are forced to repeat the level if you fall to the bottom of the screen or collide with one of the Game Police. Take it slow and be careful! The high score is recorded. It is lost if the game is powered off or you press the reset button.